This week, I'm finally able to cover a Riddler episode...and an early Riddler story from Ty Templeton, who did amazing work with the character over in the Adventures spinoffs. 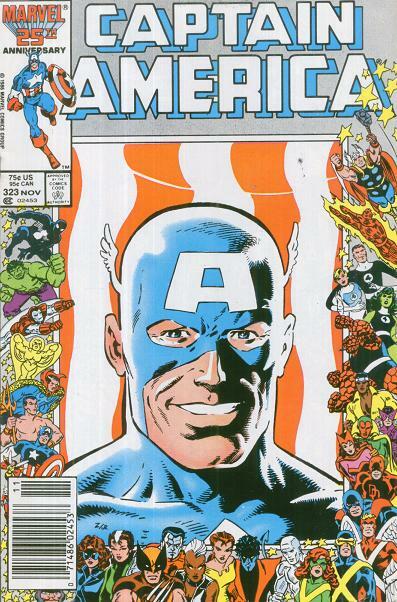 CAPTAIN AMERICA #324 - December 1986. Stunning Zeck cover! Mediocre Colletta finishes inside! Colletta also appeared to be finishing half of the previous issue, but uncredited. Actually, this looks less rushed than last issue. Now, half of the public is eager for Cap to kill again, and the other half has grown AFRAID of him. Gru really is taking this past the point of ridiculousness. Cap’s internal guilt is one thing, but the public caring this much is faintly absurd. Cap decides he needs the help of a PR firm to rebuild his public image, but somehow a fight with Trapster and Whirlwind convinces him otherwise. The buzzsaw incarnation of Whirlwind I always thought was pretty cool. Trapster, however, is already defined by the perception he’s a loser. This will be the basis of EVERY TRAPSTER STORY for all eternity. Meanwhile, Nomad has grown a Tom Selleck mustache and is determined to kill crimelord The Slug. Subplots! 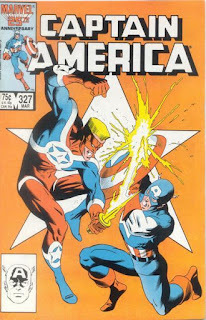 CAPTAIN AMERICA #325 - January 1987. Zeck crazy faces really are the best. No double-sized anniversary issue here. CAP wasn’t selling well enough to justify such a thing. In the early ‘90s, one of Gru’s columns covered various narrative tricks, and the trendy first person caption style. I remember Gru as dismissive of the tactic, claiming thought balloons do that job just as well. I didn’t realize he’d already experimented with the style during this run. Both Cap and Nomad have alternating first person captions, and unfortunately, they slow the story down and only indulge Gru’s tendency to over-explain what’s obvious in the art. The reinvention of Nomad begins here; unwilling to go along with Cap’s more “liberal” views on crime, believing that some criminals deserve to die. Clearly a response to the Punisher’s success, Cap’s put in position of having to rescue the crook that Nomad’s left to die in a fire. It’s actually a great use of a villain - the Slug isn’t only comically fat for the shock value, but his size is a plot point, as he’s so big it’s impossible to get him off the boat. There’s a ton of plot in only 21 pages here. An opening fight scene to reestablish Cap’s killing dilemma, an origin for Nomad’s new attitude, and a lengthy account of how he ended up on this boat. This would easily be a five-parter today. CAPTAIN AMERICA #326 - February 1987. Have you gathered that Cap feels real bad about killing someone yet? This issue, the Red Skull’s ghost appears to tell Cap that his soul is now no better than his, having taken a life. Clearly, Gru’s going overboard with this, but I view it as preferable to modern Cap not caring at all about his body count. Gru tries again with first person captions, and the results are still wooden and overwritten. Gru’s great at plotting, at understanding stories that suit the character; his dialogue is usually okay, when he isn’t doing exposition; but his prose… Everyone wanted to be Miller/Claremont in these days, didn’t they? Continuity corner - with the exception of Cap’s parents, every “ghost” he encounters this issue was later revived. Even Red Skull, who’s treated as an actual ghost, not a hallucination, is revived by Gruenwald himself. Since the final page weirdly featured half-page content, half-page letter column, the Epic Collection leaves half the page blank. You can see the original pages at the SuperMegaMonkey site. MARVEL FANFARE #31 - March 1987. Is this another Hulk solo story? So, is the goal of the Epic collections to reprint EVERY story starring the hero during a certain time period? Because that’s the only way to justify including this MARVEL FANFARE arc. 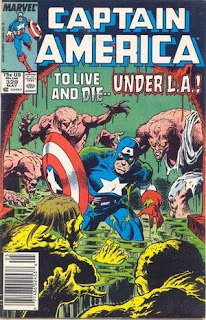 And considering the content, it wouldn’t be a shock if Marvel wanted to forget this ever existed. Since DeMatteis is the writer, it’s possible this arc was originally slated for his run as CAP writer. Kerry Gammill joins him as artist, and it’s a shame he never took over the regular book. Gammill has always been underrated; word came out that he’d fill in on X-MEN FOREVER, which would’ve been great, but nothing came of it. DeMatteis again works in eastern philosophy, when a famous guru arrives in New York. Cap’s never heard of him, and after fighting some white guilt, decides to follow his suspicions and see if this guru is on the level. 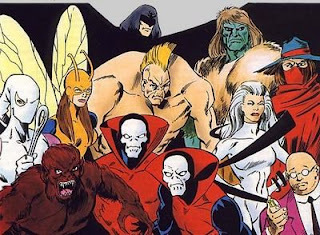 As much as DeMatteis values this culture, it’s interesting that he’s willing to allow characters from it become villains, as seen in his Haven arc in X-FACTOR. The subject matter is still treated respectfully, but DeMatteis writes the characters as individuals, which means that some will be villains. And this deceiving guru turns out to be…wow, he was still around in 1987? It’s the Yellow Claw. Funny that there’s been a conscious effort since the 1980s to treat Mandarin as less of a stereotype, yet Yellow Claw was still showing up. MARVEL FANFARE #32 - May 1987. When Cap time-traveled for his guest spot in DETECTIVE COMICS #1. 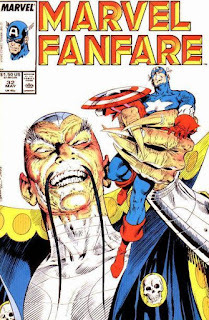 Cap’s unwanted sidekick exposes Yellow Claw, various heroes show up for the final battle, and Cap finds inner strength from the spirit of the guru whose identity the Claw usurped. Fine Shooter-era superheroics. Had it already been established by the '80s that some force transformed Yellow Claw into a monster? I believe Jeff Parker resurrected him 10 years ago as more realistic villain; clearly, this version isn't appearing anymore. The SuperPatriot plot returns, and he’s brought a gaggle of 1980s music stars with him. Life in the ‘80s - charity concerts, anti-Libya sentiment, and a cartoon caricature of Reagan youth. Funny to see the future US Agent as a slick conman. Charisma? The crowd eating out of his hands? That guy? By the way, Cap reminds us he spent a literal million dollars to set up his hotline of tipsters. And a nosy IRS agent’s investigating how Steve Rogers earned a million last year discovers his secret ID. Was Gru throwing a bone to the other side, after heavily implying Cap’s an FDR Democrat earlier this issue? CAPTAIN AMERICA #328 - April 1987. Pro wrestling! Steroids! More life in the 1980s! D-Man debuts here, as an enhanced wrestler sporting a mohawk. He shaves it off to join Cap in his quest for the Power Broker. Gru wants us to like him immediately, although it’s hard to guess why Cap needs a new sidekick. If there’s any hook to D-Man, it’s that he’s an excessively nice guy, already a contrast to the new breed of hero emerging in comics. A running theme in the story is Cap debating the Power Broker treatment, as he feels he’s the only adventurer left without superpowers. Interesting to contrast this with the LotDK “Venom” arc, only a few years away. Cap is only tempted for a few pages to enhance himself, but realizes it’s wrong. 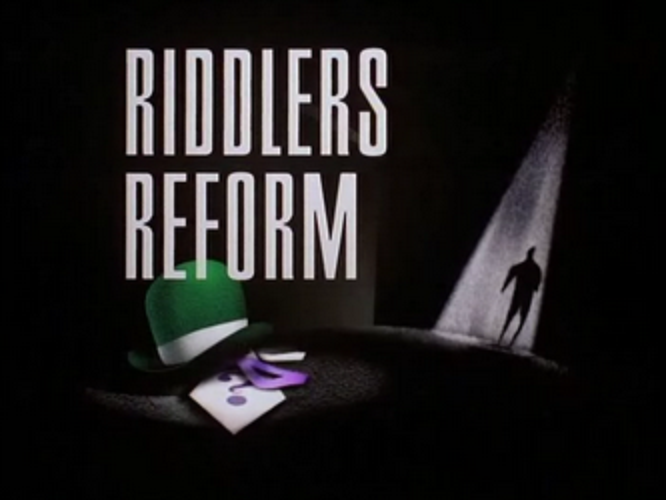 Batman, however, is placed in a situation where he “has” to do it, and becomes a drug addict for a few issues. Both stories represent the respective companies and eras rather well. Under Shooter, Marvel heroes were behaving more traditionally “DC” than DC at the time. And, as a continuity hound, Gru has to remind us that Cap DID have super-strength briefly in the 1970s. He never explains what happened to it, though. CAPTAIN AMERICA #329 - May 1987. This scene only occurs on the final page, for what it’s worth. Paul Neary’s doing breakdowns for Colletta this issue. Funny that Neary’s known now for such slick inking, and here we see him finished by the most notorious inker in history. It’s not a pretty book; some of the pages look like Larsen when he tried those Kirby pastiches in SAVAGE DRAGON. The story finds Cap & D-Man treading water until the Power Broker story wraps up. The sewer monsters are another diversion thrown in. Better art could’ve sold this, but the whole thing feels rushed. CAPTAIN AMERICA #330 - June 1987. Was D-Man intentionally designed to trick gullible kids into thinking Wolverine was stopping by? Making a surprise appearance this issue is the Night Shift, one of my favorite concepts from 1980s Marvel -- various horror characters duped into acting as a superhero team by the Shroud. Visually, they’re all interesting, and the concept is certainly unique. And after what feels like 50 issues, Cap finally confronts the Power Broker, who turns out to be an obscure villain from a 100 issues ago (seriously.) Very Gruenwald, really. 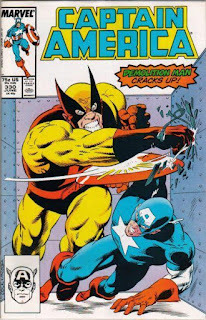 Power Broker escapes, and Cap’s left performing CPR on D-Man, who he thinks he killed in battle. Cap feeling perpetually guilty, or placed in ethically thorny situations, is another recurring theme of Gru’s run. And, through it all, Gru doesn’t go the cheap route and “darken” the hero. 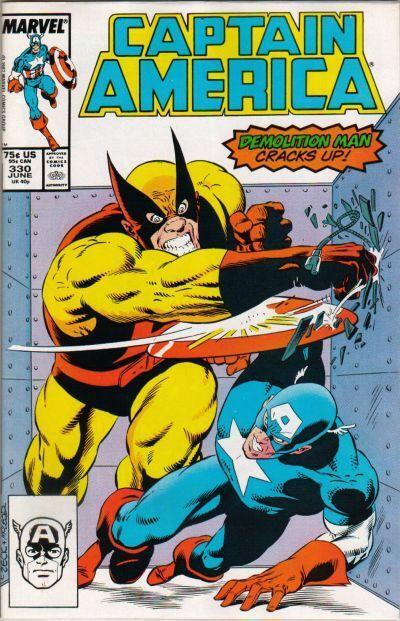 CAPTAIN AMERICA #331 - July 1987. 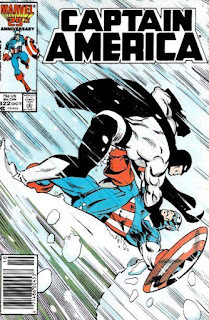 Some of these Zeck covers look like hypothetical CAP/G. I. JOE crossovers. This Power Broker arc finally reaches some sort of end. One problem with the story is Broker’s visual - he’s just an average looking guy with nice hair. Visually, Power Broker should have some angle. Since he’s the guy who gives people powers, maybe play up the irony by making him physically weak? Frail frame, hair falling out, leans on a cane; that’s be a better visual than ‘80s GQ model. Another lame visual is G. I. Max, a goofy seven-foot-tall soldier Cap fights for a few pages. 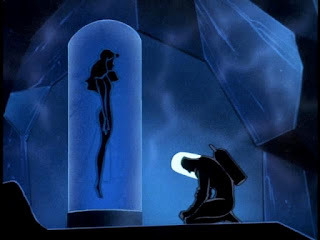 Interesting that Gru was creating this super-soldier gone wrong right after Miller introduced Nuke. One is a striking visual you’ll never forget; the other is utterly stupid. And, making all of this worse, the action mostly occurs on the front lawn of the Broker’s house. It’s all pretty dull, visually, but Gru tries to sell an internal conflict for Cap. He thinks the US government might be in cahoots with Power Broker, and doesn’t know how to respond. And while the Night Shift are his allies, some are likely wanted criminals, so he isn’t sure if he should turn them in. Shooter loved internal conflicts like this; per Byrne, he literally demanded one in each story. 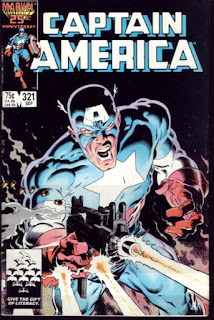 The Epic volume concludes with CAPTAIN AMERICA #332 (and a few extras.) I’ve covered #332 in the past, so no recap required there. This means our journey through “Justice is Served” has ended. Overall, I’d rank it as midlevel Gruenwald. His devotion to keeping Cap firmly CAP is admirable, and the guest stars are usually fun. The villains tend to be weak, however, and this Power Broker arc feels endless. Also -- yeesh, did we need that many Colletta fill-ins? But, even the weaker stories are setting up the next arc, Gru’s magnum opus on this book, so they’re more forgivable in retrospect. As a testament to this era of Marvel, the book is a fantastic artifact. CAPTAIN AMERICA Annual #8 - The comic every blogger was obligated to pull out of storage in 2005. 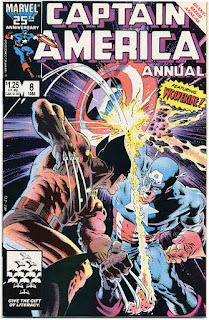 The fight we’re promised on the cover only lasts three panels, and Cap’s road trip with Wolverine in the middle is left off-panel. That would be its own full-issue chapter of the multi-part story today. Much of the story has Wolverine solo, and Gru seems to be making an intentional choice to write Claremont-style captions in those scenes. It’s not parody, but it’s a nod to the older fans who get the reference. No first-person captions, though. Wolverine wasn’t defined by those yet, and Gru tended to dislike them anyway. I Love the ‘80s Moment: Wolverine is allowed to smoke in the hospital room of an injured mutant. 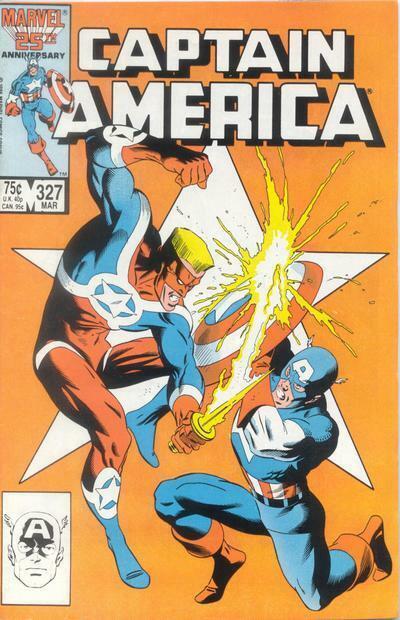 CAPTAIN AMERICA #321 - September 1986. (Captain) America! &%#$ Yeah! This is one of the defining stories of Gru’s run - the issue that has Cap gunning down a terrorist in order to save ULTIMATUM’s hostages. 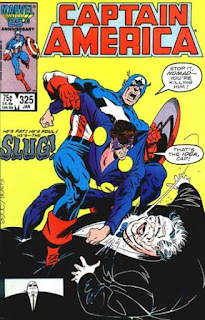 Gru’s adamant stance that Cap’s never killed before is central to his view of the character; and viewed as laughable by many readers…and comics pros. To Gru’s credit, the issue was addressed head-on in the letter column, just like his later stand against Cap using the Super Soldier serum. Unfortunately, this specific issue is fairly disappointing. One of Gru’s quirks is to over-explain every tiny detail, so instead of a tense, multi-page action sequence of Cap sneaking around ULTIMATUM’s base, it’s a slog of giant word balloons, as Cap mentally fixates over every detail of his plan. By the time you reach the climax, you’re just ready for the issue to end. Credit to Neary/Beatty for a nice-looking issue, though. And that cover…! You can see why Hasbro feared Zeck was too “intense” for G. I. JOE covers. CAPTAIN AMERICA #322 - October 1986. Cap’s so upset after last issue he’s gone full first-person caption. 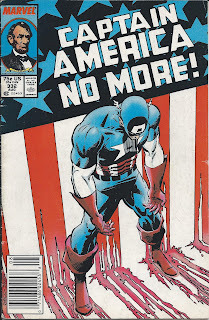 Part Two of the definitive Gruenwald CAP story, an entire issue devoted to Cap’s views on killing, one that ends with him risking frostbite or possible death in order to save the Flag-Smasher’s life. 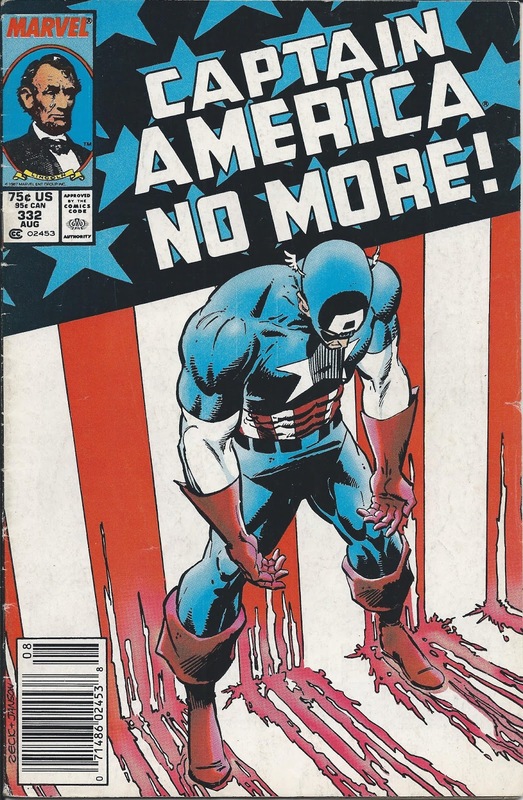 This could come across as incredibly corny, but Gruenwald writes Cap’s stance as such a moral absolute, it does read as a fundamental aspect of his character. Not that everyone agreed, of course. And Marvel’s official stance now is certainly NOT that Cap has never killed. Gru might’ve gone too far with his stance that Cap didn’t even kill in WWII, but it’s essential to Gru’s view of the character. Gru, coming of age during the 1960s peace movement, views killing in any circumstance as the ultimate violation of someone’s freedom. If Cap truly values freedom, he can’t justify killing. Gru also has Cap reassert that he represents the ideals of America, not the government. This was an important distinction for Boomers who lived through Vietnam; it’s revived here perhaps to fight against fan perception that Cap takes order from the government. (Although, G. I. JOE was insanely popular then, so I don’t think most kids cared.) The distinction does play a major role in the next arc, so this could be intentional foreshadowing. 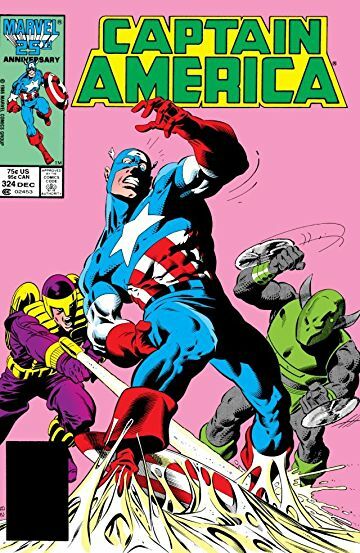 CAPTAIN AMERICA #323 - November 1986. Imagine the internet of 1986 reacting to those cover borders. The Super-Patriot, later the US Agent, debuts this issue. 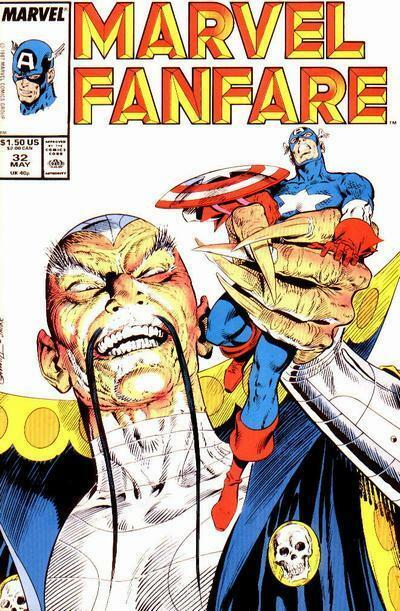 Initially conceived as a strawman argument against perceived ‘80s excesses, we see Super-Patriot as desperate for fame as America’s new hero, but unwilling to stop a mugging, because it isn’t “glitzy” enough. Gru’s plan all along was to replace Cap with this “’80s Captain America,” who initially reads as a hippie’s cartoon parody of Reagan youth. Later, Gru develops him into a more credible character; the US Agent we know today would NEVER allow an old lady to be mugged. If anything, that scene would be an excuse to show how intolerant he is of crime. If anyone did try to revive the fame whore element, it’d read as totally out of character. Meanwhile, Cap is offered an official job with SHIELD, to avoid possibly facing trial in Switzerland for killing that terrorist. The threat of legal jeopardy, and outraged public opinion, is overplayed, and some fans were furious Gru took this story so far. I personally enjoy the pure moralistic view of Cap, who refuses to join SHIELD just to avoid legal jeopardy. 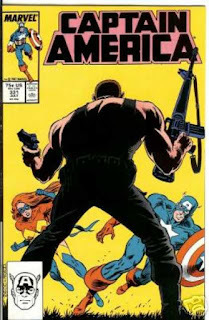 I hold the unpopular opinion that Brubaker got Cap’s character wrong from the first page of his first issue. Cap would not coldly kill a regiment of terrorists, regardless of the provocation. The lush colors and pretty Epting art can’t cover just how fundamentally flawed this interpretation is. 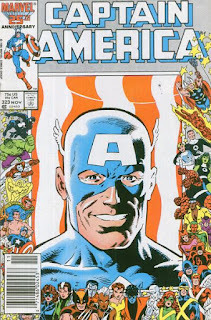 It was, ironically, a very ‘90s reinvention of Cap, even as the ‘90s were being rejected across comics. Cap killing people in the movies also feels wrong, aside from maybe the WWII montages. A much better alternative to the retcon of AVENGERS 2’s ending (which was all about the heroes SAVING innocents) would be for the indignant mom at the opening of CIVIL WAR to be the mother of one of the Loki-enchanted soldiers that Cap killed in AVENGERS. It would’ve played against his “brainwashing doesn’t count!” defense of Bucky, and not undermined the entire point of another film.